Do you know what you want? Sometimes I think I do, and then later discover that I actually want the opposite. A few months ago I entered a recipe contest in a magazine. The mission: create an original recipe using grilled steak, soy sauce, bell peppers, and any additional ingredients of your choosing. And, the entire preparation from start to finish had to take less than 45 minutes. Suddenly, my mouth was watering as I imagined a cold Vietnamese noodle salad with grilled steak, bell peppers, and other vegetables. Vietnamese cuisine is so fresh and full of tantalizing aromatic herbs. I love the combination of sweet, salty, and spicy. Though soy sauce plays second fiddle to fish sauce in Vietnamese cooking, I thought I could find a way to use it in a steak marinade that not only followed the contest guidelines, but also added another layer of flavor. While careening down the grocery aisle filling my cart with the items I would need for my contest-worthy masterpiece, I had visions of a full-page spread in the magazine and a new iPod purchased with the prize money. I also liked imagining the surprise and delight of my grandmother, who is a long-time subscriber of the magazine. 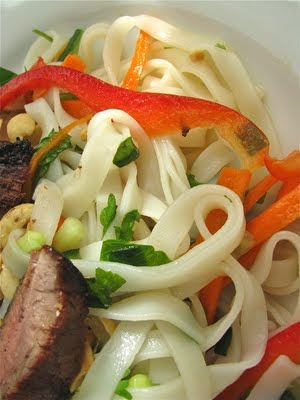 Armed with a car full of groceries, I headed home and set to work on creating a Vietnamese noodle salad to beat all Vietnamese noodle salads. After many batches and much trial and error, I finally got the dressing just right. When the salad was assembled, and I took my first bite, my jaw dropped. The dish far surpassed my expectations. I'm salivating just thinking about it. I called my parents, who live just down the street, and invited them to share it with me. The dish serves about six, but the three of us managed to devour nearly the entire bowl. We just couldn't get enough of the fresh, crisp vegetables and the smoky steak with the sweet and sour dressing. Immediately, I went online to enter the recipe in the contest; however, as soon as I clicked "submit", I found myself hoping I wouldn't win. Weird. I had spent a week brainstorming ideas, an afternoon shopping for groceries, and a full day testing and retesting the final recipe; yet, I was secretly rooting against myself. I realized that if the recipe was chosen to be featured in the magazine, I would lose control of it. As weeks turned into months, whenever I thought about the contest, I'd get both a flutter of excitement when I thought about my recipe being chosen and at the same time, there was a voice in my head that kept saying, "Are you sure this is what you really want?" Which comes first…the chicken or the egg? Has anyone figured that out yet? I started to wonder if hoping I wouldn't win was a way to protect myself from disappointment or if I really had changed my mind. I believe it was actually the later. Sometimes it just takes awhile for us to come to terms with the fact that we don't always know what we want at first, or if we do, we don't always know why. When I discovered that another recipe had been chosen, I was disappointed that I couldn't say, "hey, guess what?! I won!" but mostly relieved. Keeping the rights to the recipe allows me to share it with you. It turns out that what I wanted from the contest wasn't to have the recipe chosen, it was having the opportunity to be creative and be forced to make a meal using specific ingredients within a limited amount of time. We should be our own best advocate. If you don't root for you, who will? But when you find yourself on the sidelines, it might be time to examine your motives. Do you really want whatever it is you're pursuing? Sometimes there are other factors at stake, including low self-esteem and fear of success, but sometimes it's simply because you don't want it enough to fight for it. Or because you actually want (or need) something different. And often, as it was for me with the contest, it's the journey, rather than the destination that's important. If you don't eat beef, use chicken, shrimp, or tofu. It will be equally delicious! Instead of soy sauce, I use gluten-free tamari, but either will work. In a small bowl mix the lime juice, sugar, soy sauce, and garlic until blended. Put the flank steak into a large sealable plastic bag and add the marinade. Allow the steak to marinate in the refrigerator while you prepare the other ingredients. Boil water for the noodles. Cook them according to the directions on the package. Drain. Rinse with cold water. While the noodles cook, cut the vegetables, chop the herbs, and slice the jalapeno. Mix cooked noodles, vegetables, and herbs together in a large bowl. Chop the peanuts and set aside to sprinkle on top of the salad just before serving. Preheat a gas grill to high. Cook the flank steak, covered, for approximately 4 to 6 minutes on one side and 2 to 5 minutes on the other for medium-rare (depending on the thickness of the cut). Allow to rest for 5 minutes before cutting crosswise into bite-sized slices. While the steak is grilling, make the dressing by combining the fish sauce, lime juice, sugar, and water in a small bowl. Toss the noodles and vegetables with the dressing and either lay the steak on top or mix it in with the vegetables. Sprinkle with the peanuts and serve. My mouth is also watering just thinking of it...even without eating the meat in it, it was absolutely incredible!!! A thousand thanks for sharing it with us!! !